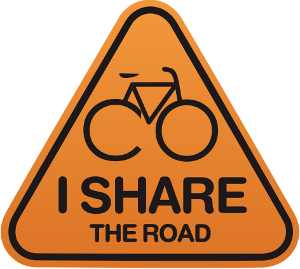 James from the Toronto bike blog – The Urban Country has started a campaign for road safety called I share the road. For as little as the postage cost ($1.50 CAD), you can get 10 x I Share the Road stickers in two sizes – large and small. Small is a great size for chucking on the bike – on the fender, mud guard, seat post, racks. Postage time to regional Qld was about 2 weeks. I think I’ll be adding these stickers to our X-mas cards for our friends and family. Below the cut is some photos of my stickers in action. There has been one particular instance in the last two weeks where I wish I had the sticker to refer some drivers to. On both my bikes. The small sized sticker fits nicely on the back of the rack. On the car – the large sized sticker. I wish it was just a bit larger. This entry was posted in Safety and tagged Commuting, Drivers Behaving Badly, Stuff We Read by jarrowz. Bookmark the permalink. I was originally going to go with 6″ stickers, but they turned out to be too big. Maybe 5″ would have been a better size. Hahahahaha! Too true. Love it!